So I’m going to bite the bullet. Maybe it’s my version of a mid-life crisis, maybe I’m just as insane as everyone always says I am but I’m going to do the 31 day challenge this year. Not heard of it before? Go take a look over at Chalkboard Nails FAQ on it. 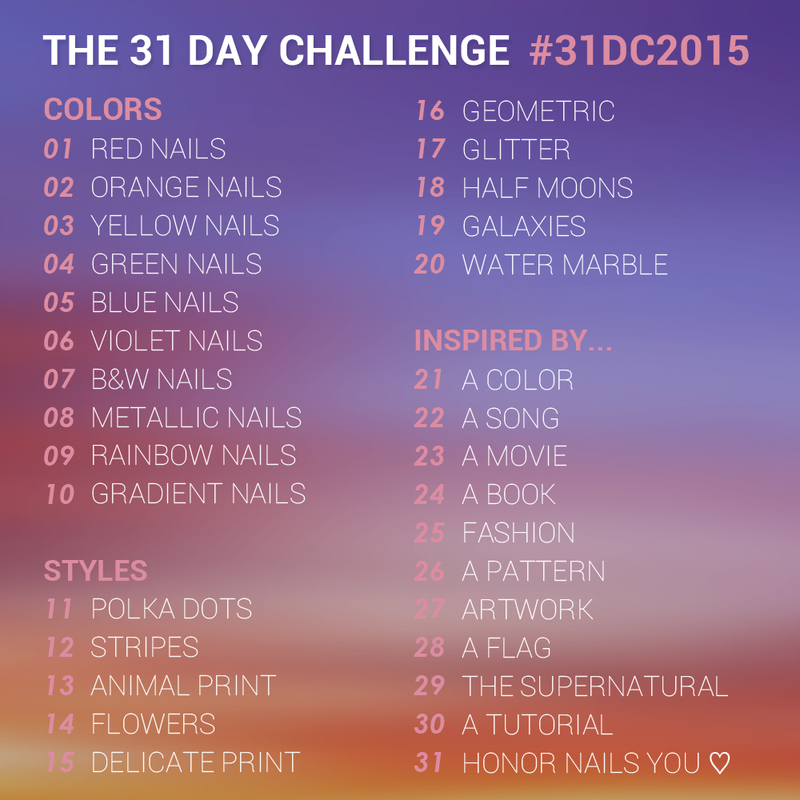 The basic idea is that for 31 days you do a different nail art each day based on the above prompts. However the beauty of it is that there are no real rules. If you can’t do a day miss it out or do it when you can, take your own time and just do what fits in with your life. It’s not a competition (though there will be a badge for people who finish it apparently, yay badges! ), it’s really just an opportunity to stretch your creative boundaries, make you think outside the box and try things you might never have thought of trying. Plus you can see what those prompts make other people think and grab some great ideas for your next set of nail art. I won’t be posting the designs on here every day, but I will try to post them on Instagram/Facebook/Twitter (along with the #31dc2015 tag) however each weekend I will do a round up of the previous week and at the end I’ll probably post a big collage of all of them. I’ve had a brainstorm and pretty much know what I’m doing for all but 2 of the days (1 of those will definitely require me to be inspired on the day itself) so I just need to sit down and get on with it now. It’s also one big push to get a bunch of pictures and ideas out there because I think once this is done I’m going to chop my nails right back, as low as they can go, because I’m having a few issues with the sides of them splitting a little. Time to start again from scratch and really get them back to full strength. Wish me luck! If you’re also participating don’t forget to use the tag #31dc2015 and feel free to leave me a link below to your blog/Facebook/Instagram/Twitter/wherever you’re uploading your pictures, I’d love to see how others have been inspired.